The Holidays are a time to get together and spend time with family and friends. These last few weekends have been filled with just that and this is just the beginning, we still have a few more weekends planned filled with good times ahead. With family gatherings come good food and good drinks. One drink that I don't drink to often, but when I do, it has to be perfect, is a the classic Caesar. There are many different ways to make the Caesar, but have you had it with the deliciousness that is The Extreme Bean?! 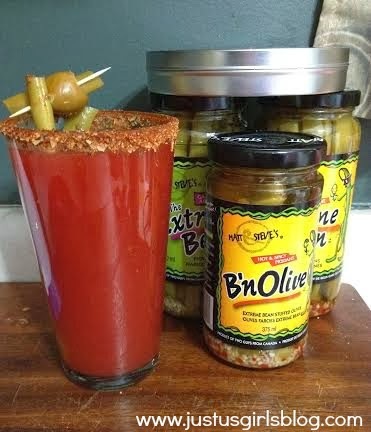 If not you definitely should add this to your grocery list to make at your next gathering, especially for those guests of yours who love drinking Caesars. The Extreme Bean is a spicy pickled bean with the perfect amount of spice, created by Matt Larochelle and Steve McVicker. This bean blows the ordinary celery garnish for Caesars out of the water. I was sent a few different products from Matt & Steve to make a classic Caesar, The Extreme Bean way and I have to say I wasn't disappointed. To make my Caesar their way they sent me their Caesar Rimmer, Extreme Bean Stuffed Olives and both the The Extreme Bean Hot & Spicy and Garlic & Dill Pickled Beans. I think I was a fan more of the Hot & Spicy Bean. It wasn't too spicy, but it did add the perfect amount of kick for my Caesar, which made it delicious. I made this for both my husband and myself and we both loved how the olives was stuffed with an Extreme Bean. The Caesar Rimmer also made the Cesar perfect as well. This had a combination of salt, garlic and other spices, which gave you a fantastic taste when you first take a sip of your drink. If you're having guests over during the holidays, I would definitely recommend making them a Caesar the Extreme Bean way, they won't be disappointed. Check out the video below with Matt & Steve sharing how they make The Extreme Bean Caesar! For more information about The Extreme Bean you can find them on their website, Facebook & Twitter. Disclosure: All opinions are my own. I received the above mentioned Extreme Bean Products at no cost for the purpose of this review. No other compensation was received.